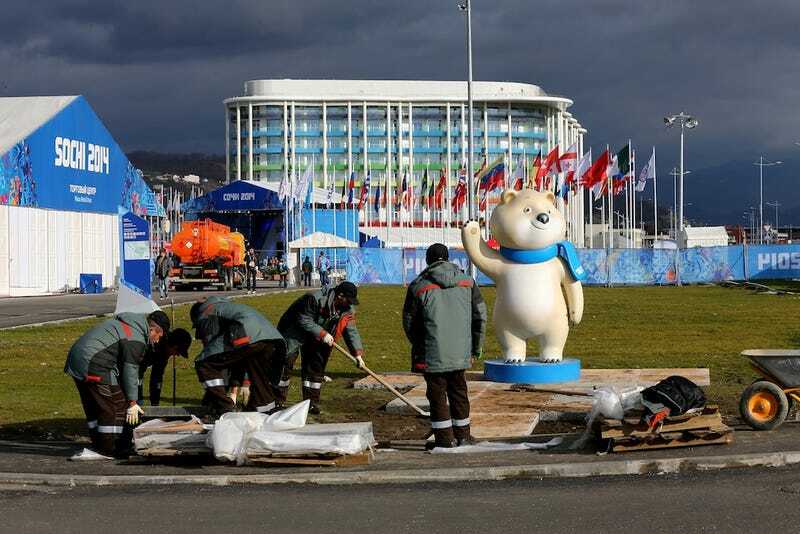 So far, the Sochi Olympics has had its share of difficulties. But there might be a sort of reasonable explanation for that! You see, while Sochi's organizers were letting everything else fall to the wayside, they were busy perfecting the one thing totally out of their control: the weather. Here's how Sochi—which is reaching a high of 50 today—made it snow. Be it through conservation, machine, or transcendental spirit guide, Russia is leaving no stone unturned when it comes to keeping their promise of snow. Which is no easy task; Sochi is one of Russia's sole subtropical destinations (and Putin's personal favorite—a delightful coincidence). In order to forego the embarrassment that came with Vancouver's Winter Games back in 2010 (which suffered from some unseasonably warm weather and, consequently, crappy snow), Sochi is pulling triple duty to make sure its powdery supply never falters. Because Sochi's relatively rural for an Olympic destination, there's not much of a meteorological history to pull from. Between that and its wildly fluctuating temperatures anyway, there was little hope of predicting how much snow would be available for the games. So when Sochi got significant accumulation last winter, there was no way they were going to let it go. About 16 million cubic feet of snow from last year has been sitting patiently in ten different makeshift, mountain range reservoirs for months. The real trick to keeping it around, though, is what's laying on top. Each pile is covered with its own giant, isothermal blanket (think those shiny, thin emergency blankets). So even during the hot Sochi summers, the miniature snow mountains were able to keep cool enough to live to see opening day. Channels have even been constructed to go from some of the highest peaks all the way down to the competition slopes, ready to send the snow down to where it's needed most. If it comes to this, ramps like the ones you see above will help create the snowy base layer—then it's time for the cannons. Organizers have acquired 450 industrial snow-making machines that can generate snow in temperatures of up to 60 degrees fahrenheit (which Sochi could very well hit), and these snow cannons are going to be on hand at every slope an Olympian touches. The canons work by compressing the perfect amount of water vapor in a cool environment, which combats one of the major potential inhibitors of snow—low humidity. What's more, this snow born of science is actually better-suited to its purpose than the natural, Gaia-grown variety. The air pressure in turbulence in the snow machines compresses each flake into a tiny ball as opposed to the paper-cut silhouette we're used to. And just like spherical ice takes longer to melt in your whisky glass, spherical snow stays solid for longer by virtue of a smaller surface area. So how does it make each of these magical little balls of Olympic fuel? First, each cannon breaks the water into tiny particles about half the size of the smallest rain drops. Next, the water is cooled to freezing; the trick here, though, is that broken-down water isn't given room to actually turn to ice. At this point, the cannon mixes small amounts of the freezing water with compressed air, and tiny particles form in a process called nucleation. But it's not just better snow these machines are making; it's better snow en masse. Olympic organizers are ready to convert about 12,000 gallons of water into snow in a minute if need be. And where, you might ask, are they expecting to get all this water? It just so happens that Joe VanderKelen, one of the lead architects of the snowmaking efforts at the Sochi olympics, discovered a conveniently placed high-altitude stream during a routine helicopter flyover a few years ago. Now, 12,000 gallons of water might sound like a lot to convert in one minute. It is! So naturally, all that snow on demand comes at a price equivalent to powering 16,000 US homes, to be exact. Yep, the snow-blowing pumps consume a total of 16 megawatts of electricity—or 16 million watts. Fortunately, though, they won't just be blasting snow out with reckless abandon; a fiber-optic automated system adjusts both the pumping and the snowmaking depending on the current weather conditions, be it a frigid tundra or a (much more likely) brisk, balmy day. Technical knowhow can only get you so far, though. At a certain point, you just have to throw your hands up and hope for the best. That's where the shamans come in. No less an eminence than Olympic organizing committee chief Dmitry Chernyshenko has called in a few Altai shamans, Siberian spiritual guides who'll be conducting a special ceremony to ensure that the typically sunny resort town somehow brings snow in time for the games. According to Chernyshenko, these shamans know what they're doing.